(Black Mask Studios – Writer: Matthew Rosenberg, Artist: Tyler Boss). 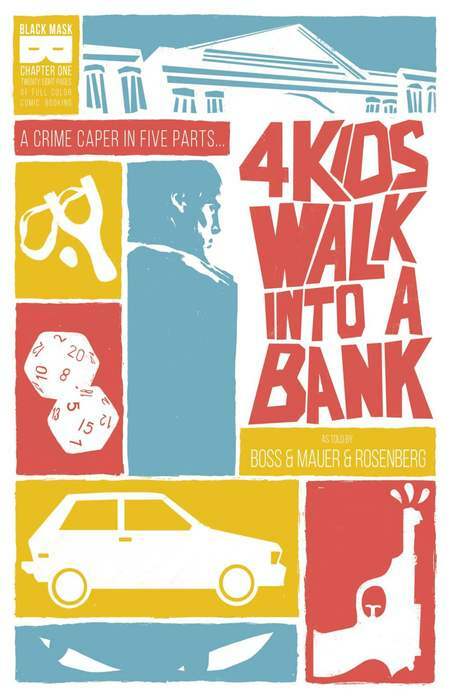 4 Kids Walk Into a Bank is a five part miniseries about a group of 11 year-old D&D nerds who decide to rob a bank. The twist? They want to save one of the kid’s dad from his partners’ incompetence. It’s a heist story in the vein of The Outfit or Kelly’s Heroes mixed with kid adventure classics like The Monster Squad and Goonies. Rosenberg and Boss spend the first issue developing their cast so well that you know Paige and her friends as well as that kid who flicked boogers at your head in the second grade (Wait, is that just me?). By the end of the first issue Paige, Berger, Stretch and Walter (the titular four kids) are clearly defined. We first meet them at a disastrous Dungeons and Dragons game, then we see them stand up to some thirty-something scumbags and that leads our characters down the road to the book’s premise. The charm of 4 Kids Walk Into a Bank is that we all knew these kids growing up – heck, we were these kids! I was totally Walter, hiding out in the corner and following my more socially daring friends, piping up with an idea here and there. 4 Kids is a spiffy looking comic. Tyler Boss’ art is crisp and moves the story at just the right pace. The comic has two big double page splash scenes that I hope Boss makes into a print. The panel design in the book is versatile. Boss packs a lot of character work into every page. There’s a ham radio scene where the kids are plotting a stake out that’s reminiscent of Brian Michael Bendis’ Jinx and Daniel Clowes’ Death Ray. The character acting within two 24 panel grid pages pays off with a classic ham radio gag. I had so much fun reading 4 Kids Walk Into a Bank that I forgot the plot’s hook by the time I got to the last page. I know what the kids are going to do from the advertising copy, but hot damn, the script and art are compelling! 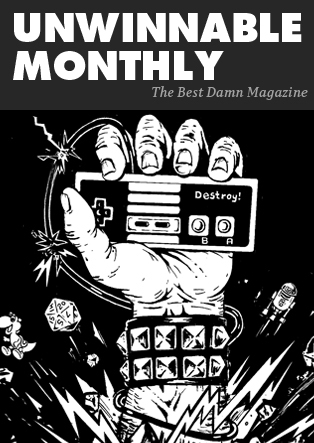 Chalk up another win for Matt Rosenberg and Black Mask Studios. (Dark Horse— Writer: Fred Van Lente, Artist: Brian Ching). The conclusion of “A Witch Shall Be Born” and of Conan The Avenger is here. I end the previous sentence with a period and not a senses-shattering exclamation point because this issue felt like a wrap-up, and not epic as the lead-up issues may have suggested. 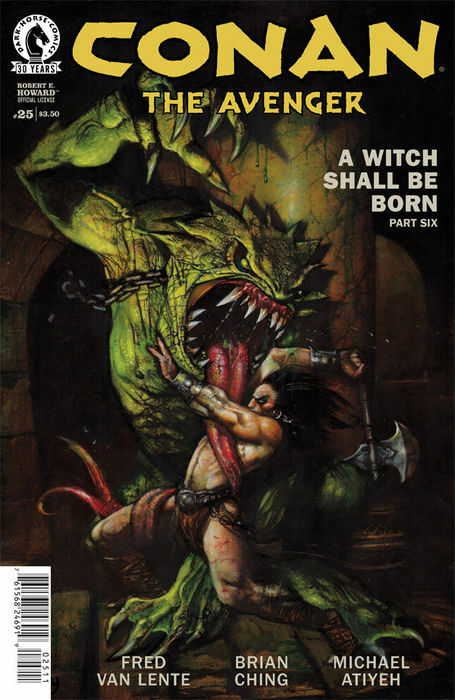 Hell, even a classic Conan monster battle as teased by the fantastic cover art by Simon Bisley would have made this issue. Instead, every story thread wraps up, the bad guys are kicked out, the queen retains her throne from her twin witch sister, the monster is laughably dispatched quickly by the archers of Conan’s mercenary army, Conan gets some crucifixion revenge, and by the end everything returns to the status quo. This isn’t the fault of the creative team. Unfortunately there are only so many original Robert E. Howard Conan stories to draw from, and at this point Dark Horse has been trying to intersperse the classic adaptations with original stories just to keep these Conan series going. While all of the Howard Conan stories are enjoyable, they vary in quality from absolutely awesome, to pretty good filler. Still, as a whole this was an enjoyable adaptation that may read better once collected. I suspect Dark Horse wanted to adapt it because fans instantly can identify it for the iconic crucifixion sequence. I never fully warmed to Brian Ching’s art, but enjoyed it a lot in this issue. There’s a lot of crazy chaos and bad guys being brutally disposed of, and the colors by Michael Atiyeh really bring out the brilliant reds, dark shadows and blue supernatural hues nicely. The lead up to witch queen Salome’s last big gamble of unleashing the dark god Thaug on the rioting people is suspenseful, and Ching’s use of perspective and shadow showcasing him as he emerges from the rubble of the Khauran temple he just destroyed is truly foreboding. Which makes what happens next that much more frustrating. We’re promised a throwdown with Conan and a crazy reptilian dark god, and instead we get the dark god being unceremoniously taken down very quickly by arrows. It’s almost comical, and when doing a little research on the Wikipedia, it turns out that Robert E. Howard had originally cranked the story out in a couple of days to meet a deadline quota for Weird Tales, the original publisher.Structurally the story as a whole only works when it focuses exclusively on the main character, otherwise Conan is really just a part of a larger cast of less interesting people in the overall story. The events in the story could be great, but Salome and her crew are mustache twirling villains (in some cases literally), and the people of Khauran and their true queen Taramis are mostly pushovers with no real depth. There is definitely a rushed quality to how “A Witch Shall Be Born” resolves itself, but there are moments of brilliance as well. I highly recommend tracking down issue #21 of this story arc and then starting from the beginning if you like that issue. Of the Robert E. Howard Conan stories, none of them are bad, but like anything that is released in anthology and serial form, some portions of it are stronger than others. Dark Horse has had a great run with the character, so here’s hoping for a new iconic Conan scene in the upcoming Conan The Slayer series. Conan The Avenger #25 is available in a comic store near you this week! (Dynamite – Writer: Warren Ellis, Artist Jason Masters). 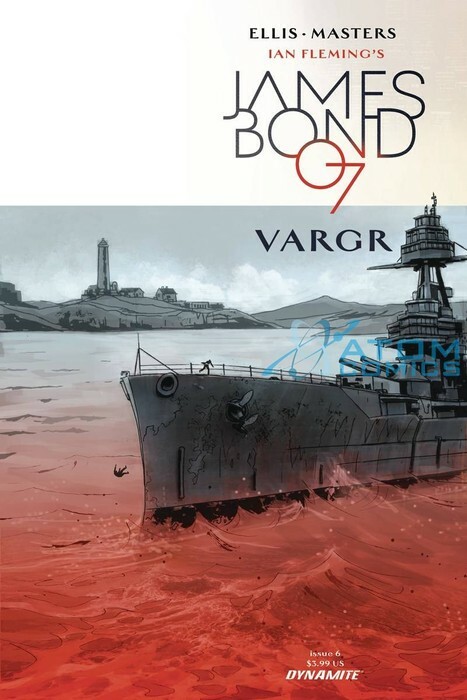 James Bond #6 is a brutal, succinct ending to the first arc of the revived Bond comic over at Dynamite. Warren Ellis’ current run on James Bond is unlike perhaps any other Bond in the history of Bonds. He’s quickness to violence is second to none; he’s almost breezy with the way he strolls onto the page and ruins the day of anyone who dares to cross him. He’s also more progressive than the novels. Ellis strips away Fleming’s insecurities about himself and portrays Bond as not only confident, but tired. He’s the best, knows he’s the best, and doesn’t care. James Bond #6 isn’t the conclusion to the most breathtaking or original storyline, however. I had no idea what the villain Slaven Kurjak was actually planning, or how he would get away with it. Even if you consider him totally mad, his plan consisted of selling bad drugs to people, and then making cyborgs to do…something? Though, in the greater Bond canon, this isn’t really the greatest crime. Once Bond left the Cold War things got kind of loose. Bond has fought vodun priests and newspaper magnates, saved Silicon Valley, and stopped a North Korean satellite which could channel the energy of the sun. Kurjack is by no means the worst offender when it comes to villain lunacy, but that doesn’t mean he isn’t dull. What Kurjack does have going for him is that he looks better than all those other fools. Well, except for Christopher Walken. Ellis gives Jason Masters something that no Bond baddie has ever had: bullets that totally shred their target and full discretion to show off the effects. Those effects are gorgeous. Masters is not subtle with how he shows one of these shredder rounds shredding through a skull or a foot, and it somehow never feels excessive. It feels instead like Bond has been censored all along and only now is he fully being unleashed. It’s brutal, and you can almost hear the “shhlorp”s and “krukk”s as the bullets blow out another chunk of a thug. Watching Bond off of his leash is a thing of beauty. Though other Bonds have really turned on the violence this Bond does it with a steely look of pure concentration. He doesn’t come out unscathed, and that’s perfect. This is a Bond with scars and history. He’s been places and seen things and gotten beaten up. It’s more than scripted violence, its choreographed. Since the first issue of James Bond I’ve had a tickle in the back of my mind that had not solidified until now. Ellis and Masters have created a James Bond for the era of Archer. If Sterling Archer is a perfect satire of everything that the Fleming novels and EON films were, then Ellis and Masters’ Bond is a perfect satire of Sterling Archer. Ellis and Masters have made a Bond who is controlled violence in its most distilled form. (Heavy Metal – Writers: Eliot Rahal & Daniel Kibblesmith, Artist: Kendall Goode). The Doorman’s world centers on those that mind the cross dimensional doorways between planets across the universe. They’re a union of intergalactic porters known as Doormen, and they all got murdered by an interplanetary businessman, Carlisle Moongale. Well, almost all of them got murdered. The titular Doorman of this series is Henry Clay Waters. Henry gets drawn into an intergalactic conspiracy on the day he’s supposed to retire. Lucky for him, a lone alien cop, Detective Flower, intervened. The last issue left off with a pretty stark cliffhanger – one of Moongale’s thugs shot Flower in the head right before Henry shut his door. Sure, we just saw pretty much all of Henry’s Porter peers get slaughtered, but I got to know Detective Flower, she was funny and charming. Seeing her get shot in the head packed a wallop. That’s where Rahal and Kibblesmith got us though. The Doorman is absurdist sci-fi in the vein of Hitchhiker’s Guide to the Galaxy and Red Dwarf, so human anatomy doesn’t exactly apply to pink skinned aliens. It’s a bit of a cheat, but since none of the other porters popped up again, it washes as a solid cliffhanger. The rest of the issue explores just how deep Moongale’s conspiracy (and pockets) go as Flower and Henry head straight to Flower’s precinct. Here we meet Flower’s overworked boss and a dopey, but apparently good-natured (and thorough), janitor. Rahal and Kibblesmith’s script is a mix of reveals and hints regarding Moongale’s plot, but Kendall Goode’s design and storytelling are superb. All the aliens in this comic look so damn weird but Goode’s facial expressions really sell these characters. Flower doesn’t have a nose, but she’s just as expressive as Kevin Maguire’s Black Canary. The panel layout keeps the story moving. Whether it’s an open eye or an exploding head, Goode sells each and every visual punchline. 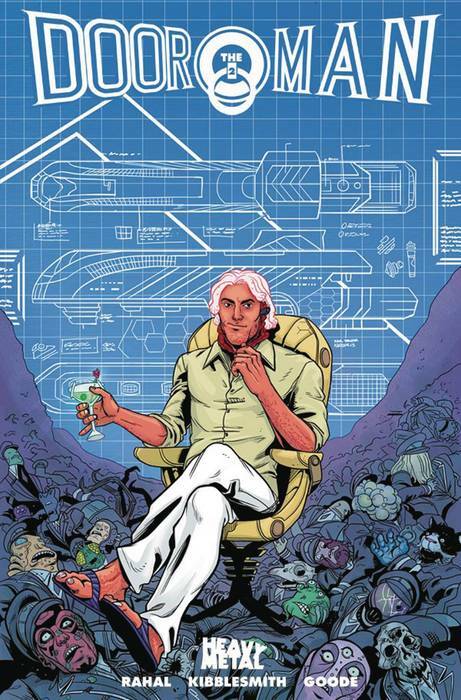 Heavy Metal’s been publishing some good, bonkers sci-fi comics, lately. The Doorman # 2 is hilarious and exciting. Tired of comic universes that can’t keep their mythologies straight? Pick up The Doorman and 4 Kids Walk Into a Bank instead! Mike Mignola made a very smart move when he graced us with Hellboy and his world in 1993, and that was placing the action more toward the end of Red’s career. When Hellboy began, the loveable demon with a heart of gold and a giant red hand had been kicking around Earth for almost 50 years. 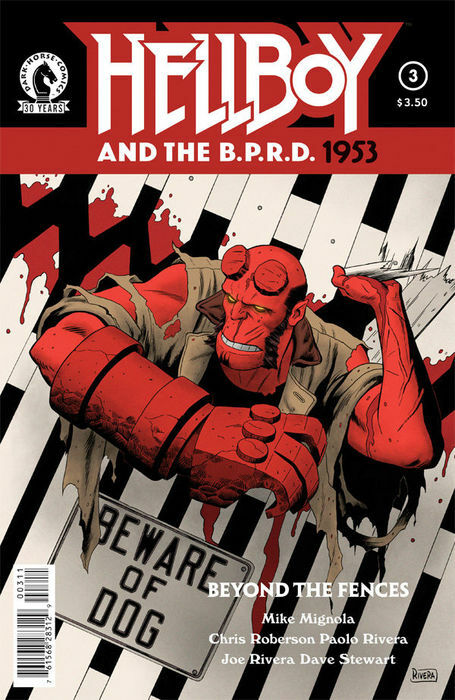 Many images implying his past adventures have appeared in the various Hellboy and B.P.R.D. comics over the years. So what a treat it is that we get to see some of these past adventures while Hellboy is wandering around Hell. Hellboy and the B.P.R.D. 1953- Beyond The Fences #3 is the third part of a three-part story where Hellboy and the B.P.R.D. are on a mission investigating the disappearances of pets, children and adults. It ends up becoming a fun romp, fighting a giant mutated dog in the suburbs. As this third part of the Beyond The Fences story wraps up it, presents fun future storytelling possibilities for the Mignolaverse, while also adding to the apocalyptic storyline that take place in the present day. If you’re like me and slightly overwhelmed by the continuity of the present day stories related to the B.P.R.D., then I highly recommend these flashback comics. You only need to know the basic premise of Hellboy and his world to hop aboard. The goal of these comics are to present fun and/or creepy stories with a nice dose of action, while also allowing the main story to wrap up and move on. Plus, if you’re knowledgeable on the Hellboy mythos, then there are plenty of Easter Eggs relating to more current stories like Plague of Frogs. These are presented subtly. This story is about some paranormal investigators and the police fighting a giant mutated dog, after all. Paolo Rivera’s art for this series is bright and detailed, with little Mignola-inspired touches where necessary. It’s a welcome break that illustrates the classic pop culture representation of an American suburb during Eisenhower’s administration. Except for the demon in shorts and a t-shirt walking around smoking cigarettes and the very Mignola-inspired mutant demon dog, everything else is very unique for a Hellboy comic visually. Paolo Rivera also draws Hellboy in a different inhuman way to separate him as an otherworldly entity from all this. With all of its brightness this series also retains the dark humor and tragedy found in other Mignolaverse books. The dog really is just a pawn in a sinister supernatural game. Like many monsters Hellboy fights it’s not evil at all, and like most animals, it’s just a victim of the greed of power hungry humans. It’s also cute and fun to see how awestruck civillians are by Hellboy, who at this point relishes the attention that he receives since he’s portrayed as a real-life superhero by the media. In many ways these are brighter days on the Earth, many decades before things get very bleak. I’m hoping to see more of this great series. While I love the almost finished Hellboy In Hell it’s refreshing to still be able to check out new adventures of Hellboy punching things and being in a happier place. Hellboy and the B.P.R.D. 1953- Beyond The Fences #3 is available to purchase at comic book stores this week!